Rich and creamy coffee blend for on the go goodness with benefits of, Ginseng, Ganoderma and Maca. 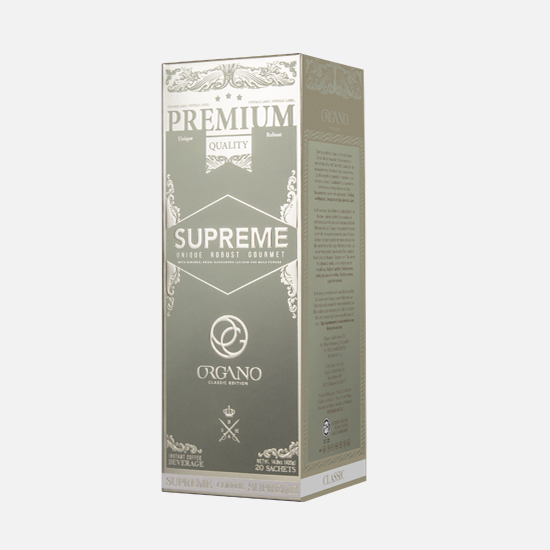 Organo™ Gourmet Café Supreme is a light and mild blend of coffee, with a creamy flavour and light sweetness. Subtle notes of cinnamon and chocolate down to how the coffee is roasted make this an ideal blend for morning or a midday pick me up. Organo™ Gourmet Café Supreme is a robust and flavourful coffee for an anytime energising pick me up. Mild and lightly sweetened, this creamy coffee is ready to mix in an instant. Contains Ginseng which has been used around the world for its flavour and benefits. Also contains Ganoderma, a treasure from Asia known and used in cooking, in teas, and other products, along with Maca, an ancient Peruvian food that has been cultivated for centuries by the indigenous population of the Andes. Coffee – one of the most popular beverages in the world. Organo™ uses a mild, easy to mix instant coffee that is light and flavourful with hints of chocolate and spice undertones, and creamy lightly sweet flavor. Energising and convenient, for on the go instant coffee benefits. Ginseng – ginseng is drunk in coffee from Bali to Milan. Ginseng delivers a slight spicy note. 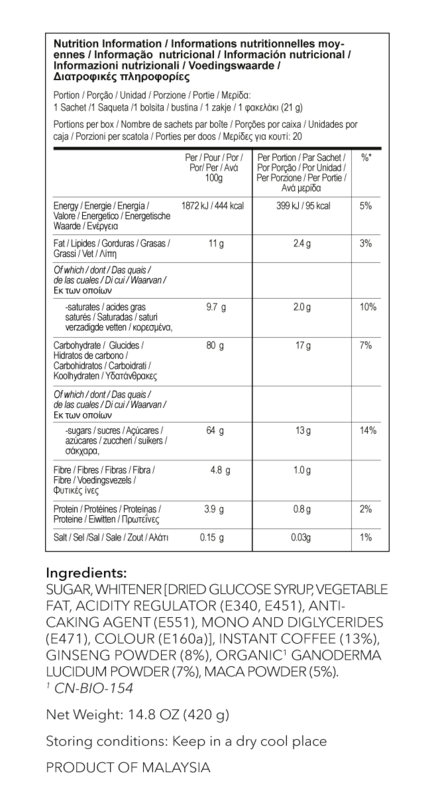 Ginseng has been consumed for thousands of years and naturally contains phytochemicals. Over five thousand years ago, in the mountains of Manchuria, China, Panax ginseng was commonly used for its rejuvenating powers. Maca – maca is a plant grown in the mountains of Peru, and is considered sacred, and has been revered for thousands of years. It is a sweet, spicy root considered a delicacy and is used as an ingredient in cakes, flans smoothies and even beer. Used for thousands of years, the Inca’s cultivated this plant over 2,000 years ago. Coffee has many benefits. It helps you feel energised. Coffee may contain antioxidants. 6 oz. 8 oz. 10 oz.